Made of rust-free Aluminum and includes post, bracket and roof mounting base. 3 Series to choose from. Garden, Standard, and Estate. 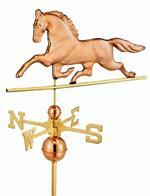 Copper weathervanes are forged in copper and brass.